Great photo! Dan Neale of La Verne CA holds up a beautiful late-season bull dorado caught just outside of Bahia de Los Muertos on a live sardine. 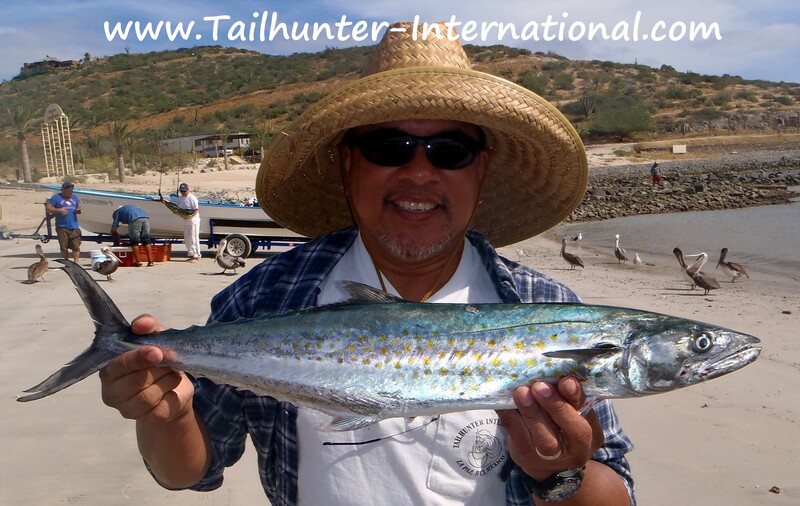 Dan was on his first trip with Tailhunters in La Paz. 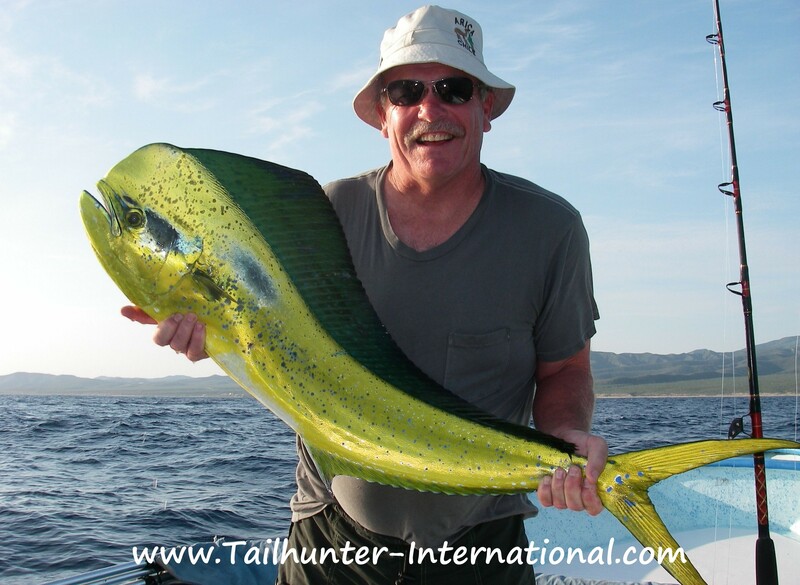 The dorado are still biting! With Captain Pancho all wrapped up (he has an allergy to dust!) 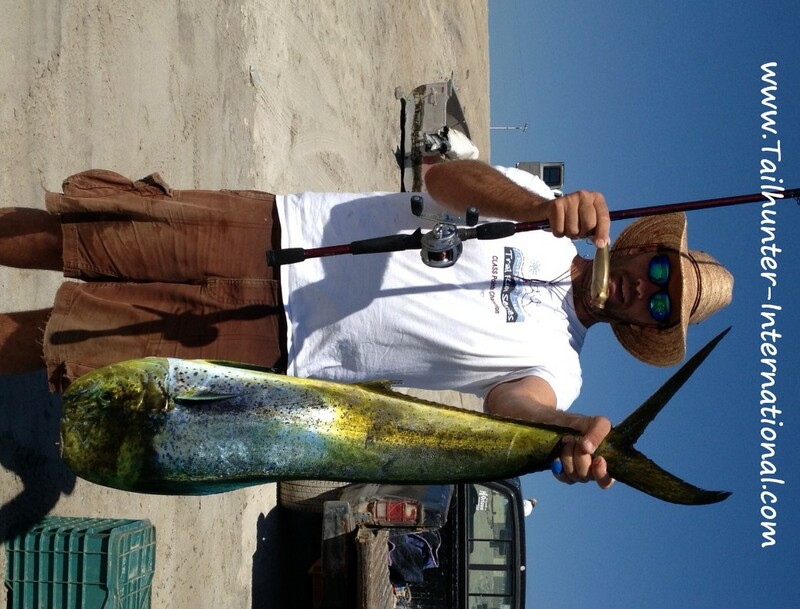 he helps out my high school classmate Gary Howarth who poses with another dorado he caught south of La Paz. Don’t know how much longer the dorado will be around, but they’re a welcome catch right now with the seasons changing! There are days when you can catch these all day or a quick limit within a short time! Sierra schools have moved into the shallow drop-off areas and live bait on a thin wire or else trolling small rapalas or yo-zuris or anything shiny will get a viscious strike! Great eating fish and a favorite for ceviche! It’s that time of the year and one of the great draws in La Paz right now have been the whale sharks swimming in the bay in shallow water. 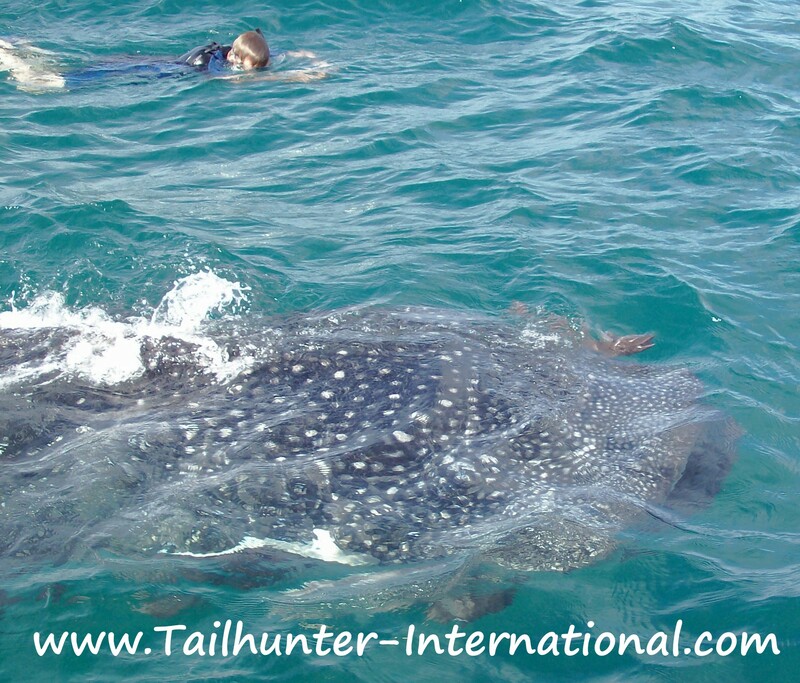 Snorkeling with these 15-30 foot gentle giants is an incredible afternoon adventure and only several hundred yards from the city waterfront. We hope everyone had a safe and happy Thanksgiving and Thanksgiving weekend! We’re grateful to all our Tailhunter friends and tribal members who read our fishing report each week! We’re still doing some pretty good fishing for so late in the season and the mix of fish is really surprising. With northern winds getting stronger and air temperatures getting cooler, I’m really happy to see such a great variety of species that we’re catching…most importantly the “glamour” warm water species that so many anglers come to catch! Almost all of our fishing now is out’ve Las Arenas where even if the winds are closer, we’re more protected for launching our fleet as well as just more comfortable fishing! When fish are as close as just a few yards from shore, there’s no reason to run way outside and get bounced around and get your kidneys shaken loose outside the wind line! But that’s what makes it fun right now. In addition to a decent dorado bite of 10-25 pound mahi both inshore and hear the closer buoys, the southern side of the island is still getting some late season wahoo bite with fish up toe 45 pounds. Rapalas doing most of the damage, but several were hooked on bait while guys were fishing for other species. The biggest hinderance is the wind which can really whip it up getting over to that side of the island from Muertos Bay ahd headed north. But not far from shore from the Arenas lighthouse down to about Pescadero, we’re encountering dorado, roosterfish, nice batches of sierra, pargo, cabrilla, rainbow runners, pompano, bonito and jack crevalle. All of this can make for a lot of action in a fishing day! Live bait is not a problem most day with live sardines available for purchase although they do tend to be on the smaller side so smaller live bait hooks are suggested. Due to the time change, I know it sounds early, but we’re leaving the hotels at 4:45 a.m. to get out at first light. Hopefully, the bite will continue a few more weeks! Jilly Roldan of Tailihunters! We finally were able to get her out and she still has game! She and Captain Pancho hooked up for this sweet-colored bull dorado she took on 30-pound test and her new “Chix Stix” custom-wrapped gift from B&B Custom fishing rods in Portland. Dorado were surprisingly biting great for this time of year! 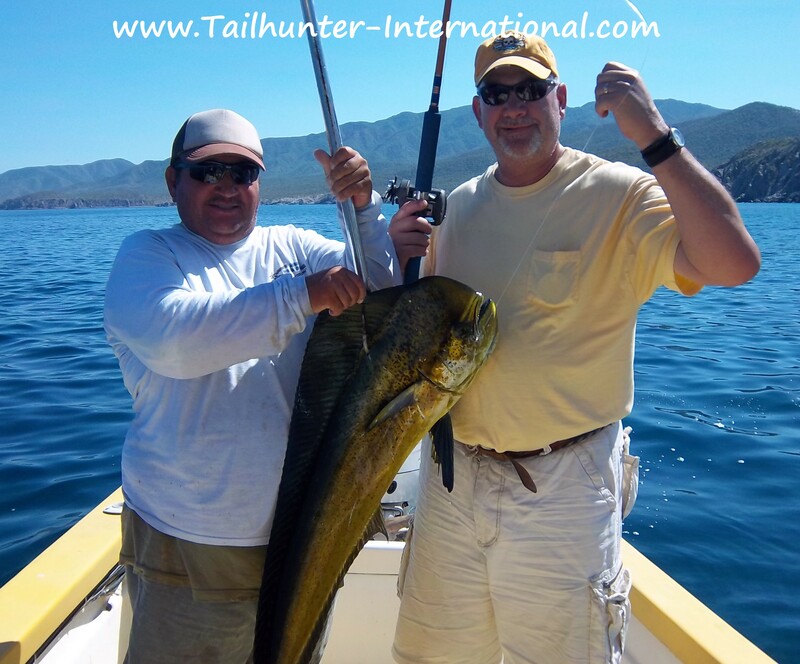 Gary Howarth and Dan Neale from La Verne CA were on their first fishing trip to La Paz and enjoyed some great fishing. 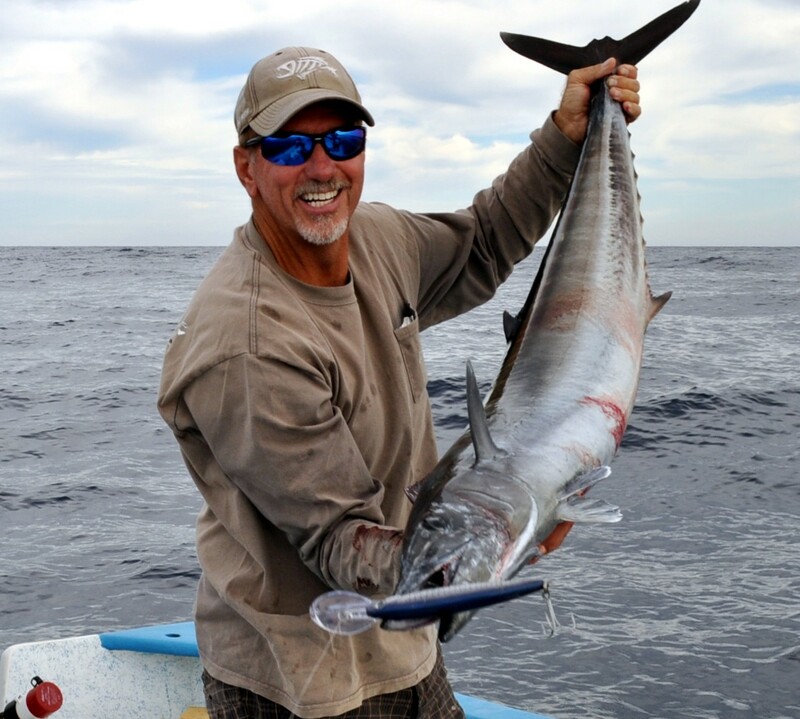 “We started with sierra and caught and released so many we had to stop!” said Gary. “Then we went just a little bit further out and we hit one buoy and got into double and triple hookups. Again we released so many fish. Great day!” They were fishing just outside of Muertos Bay. Raul Chollet has the “bug” after trying fishing for the first time with us. 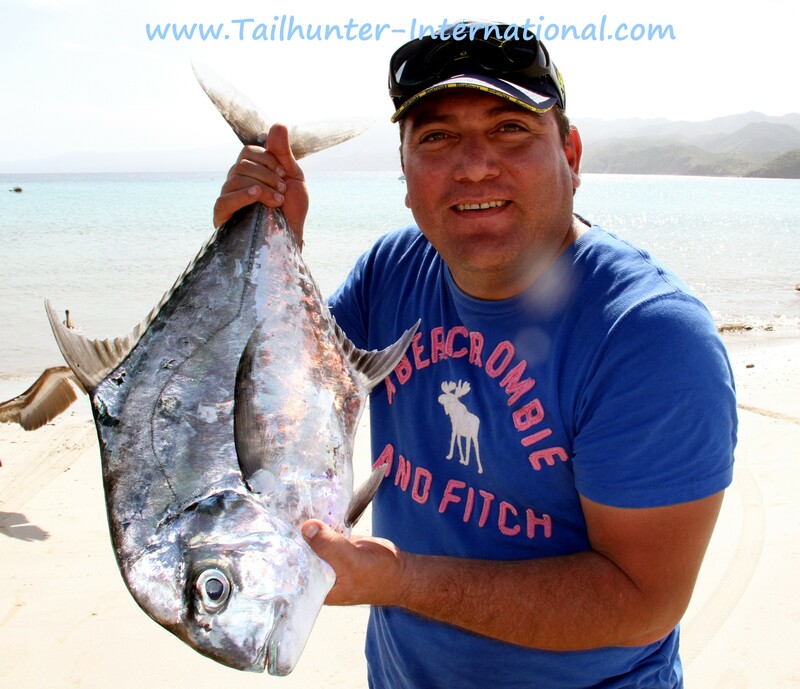 He got 5 dorado, 2 sierra and this great-eating African pompano (palometa) fishing in the Las Arenas area not far from shore. He’s posing with a funny face just for the camera! 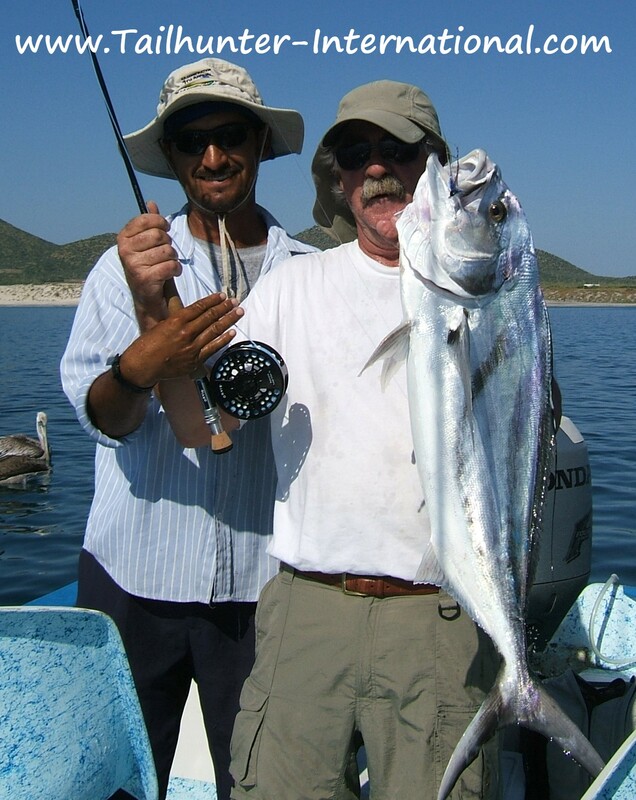 But our amigo, Raul Ramirez, shows off one of the sierra he caught which are biting great right now. 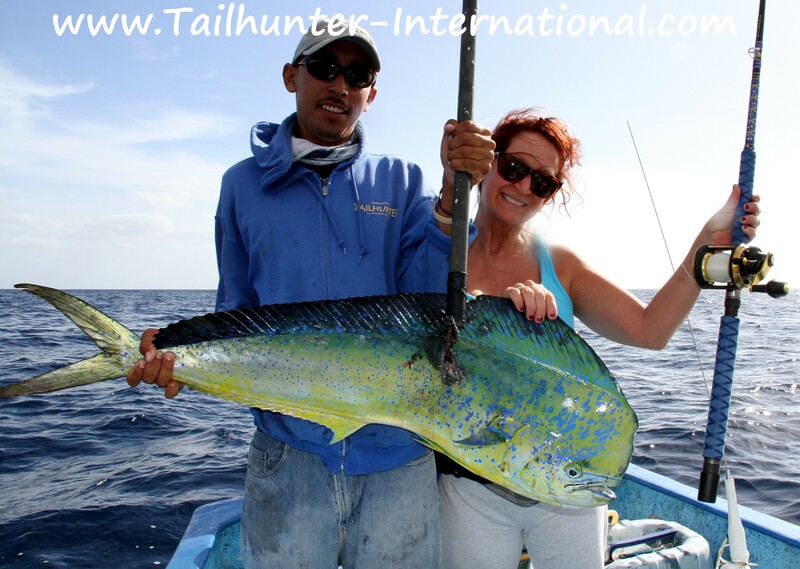 He also got dorado as well and brought his mom and son to the Tailhunter Restaurant to have us cook it up! Raul owns the popular “Sinatra” karaoke bar in La Paz as well as the “Casa de Villa” bar on the malecon. I almost hate to post Roger Thompson’s photo here! Great wahoo shot. Roger found the high spot at the south end of Cerralvo Island and got a rack of these nice ‘hoo while trolling deep divers. Roger lives right there across from the island at La Ventana, so he’s not only an outstanding fisherman, but can see when it’s good to go out. If its too windy, he grabs his windsurfer. If it’s calm, he goes fishing! He’s living the dream! The problem with going to the island is that with north winds, it’s often tough to get out there this time of year. Roger can pick and choose the best times plus has his own boat or can grab a local pangero. But nonetheless, a great catch and good to know the elusive wahoo are there! Dos amigos! Raul Ramirez y Raul Chollet were pretty excited about their dorado catch. It’s always good when first timers get into fish! DORADO SIERRA AND A VARIETY OF SPECIES PUT ON A NICE SHOW FOR LATE SEASON! Really a surprisingly excellent week of fishing. Now that the winds have started coming mostly from the north, it’s a little rough to fish out’ve La Paz so all our fishing has been with our Tailhunter Las Arenas Fleet pushing out’ve Bahia de Los Muertos. I thought things would have turned since things are cooler but we had some really fun fishing. 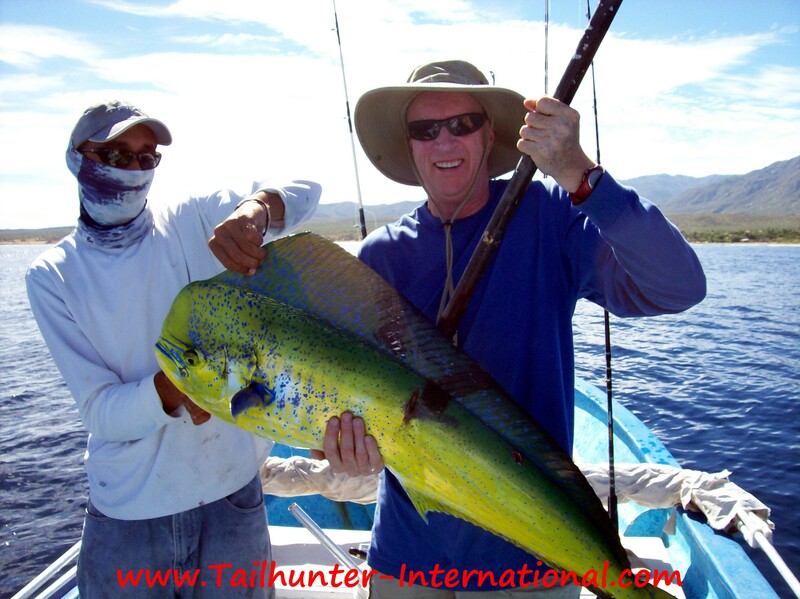 In fact, some of the best dorado fishing in weeks has been going on with fish between the shore and inner buys just outside of Muertos, our anglers have been taking limits of dorado up to 30 pounds with most a fun 10-15 pound side, especially fun on light tackle! Some of the fish have literally been in shallow water just yards from the shore or rocks in areas where the anglers were really fishing for other species! The best thing about the fishing right now, in fact, has been the plethora of other types fo fish we’re hooking. It almost reminds me of spring-time fishing with breezy conditions and cooler temperatures and as many as 10 different species a day this past week! In addition to the dorado, the sierra have been going great. Some pangas hit early limits of all the sierra they need then go run for dorado or other species such as pompano, jack crevalle (nice school just ouside the bay), roosterfish, bonito, pargo, and cabrilla. We’re even still hooking some billfish with striped marlin and smaller sailfish close to shore as well. Plus, yes…there’s even a wahoo or too if you can get over to the island in the wind. All-in-all, a good week! Not sure how much longer it will last, but we had a great time this past few days! As pretty a picture as you can have. 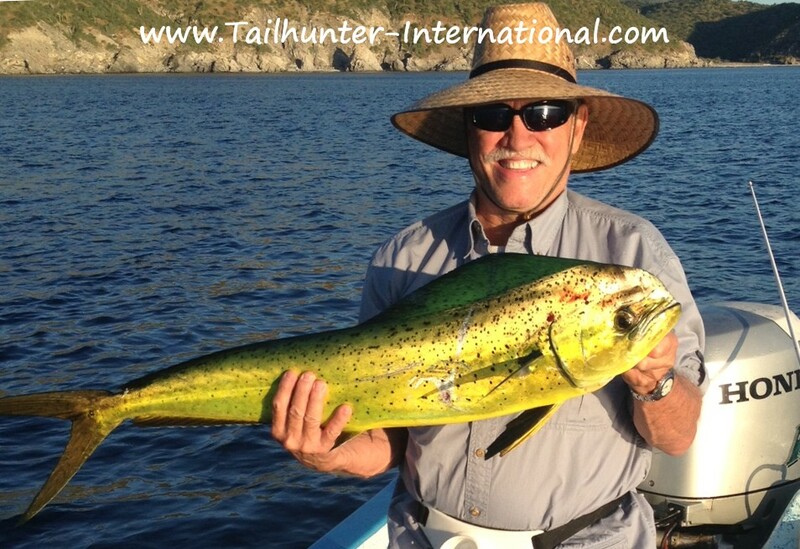 This fresh bull dorado shows great colors after being caught by Mark Tefelski from Los Olivos CA near Santa Barbara. A good little run of dorado was a surprising highlight of the catch this week. Mark got this one just outside Bahia de Los Muertos. 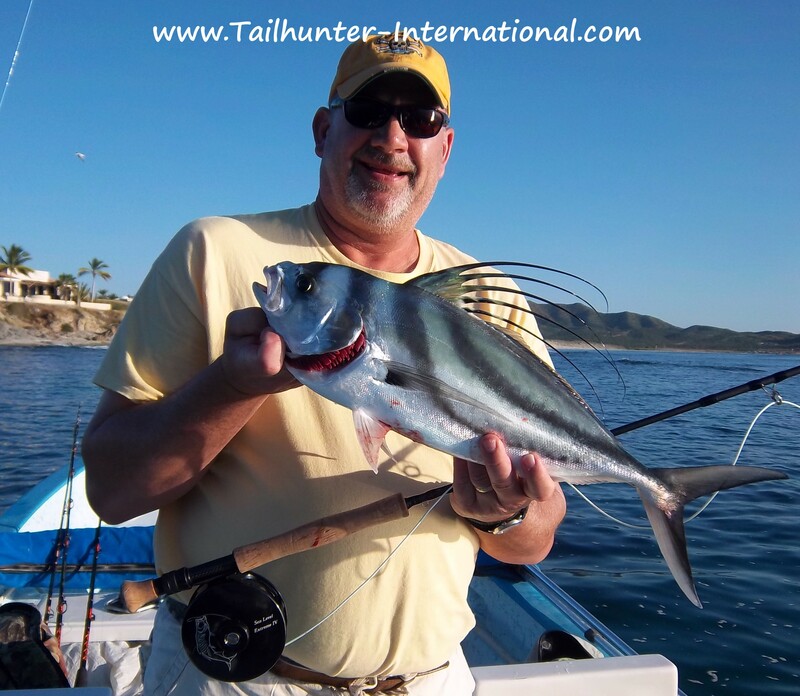 It was another good week for late-season roosterfish like this one caught by Randy Bartholomay who visited us from Gaviotas CA. The roosterfish have been schooling near Cerralvo Island and then in the area between the Arenas lighthouse and Boca de Alamo. This guy was released. There’s still some dorado north of La Paz although it’s getting windier and choppier as north winds increase and the season changes. But, Randy Choate and Captain Rogelio pose with a nice dorado they caught near Espirito Santo Island. Randy is from Idaho. Our flyfishers have been having a surprisingly good time as long as the winds stay down. 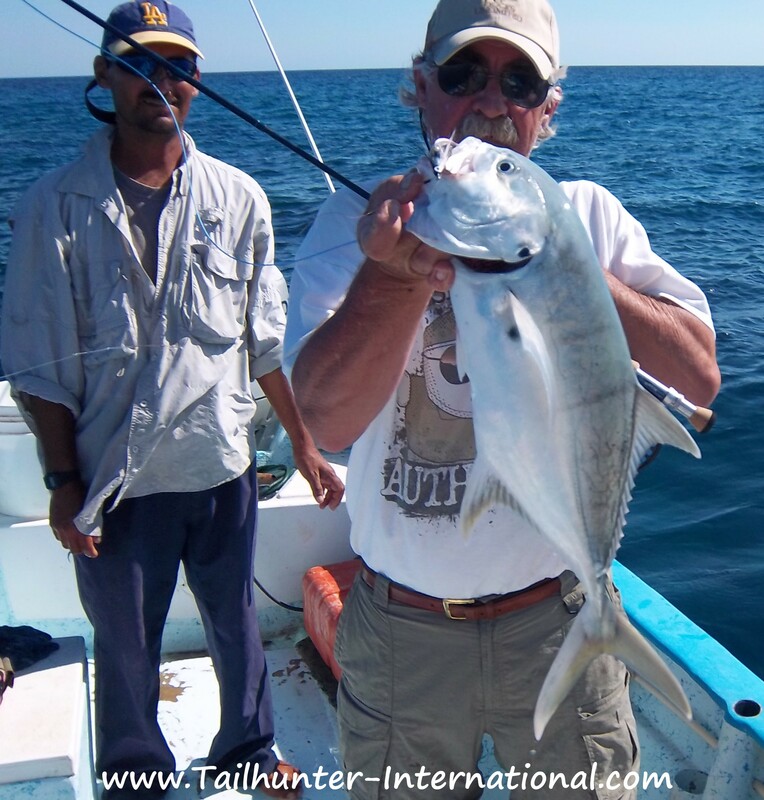 Tom Ames and Captain Adolfo with our Tailhunter Las Arenas fleet hold up another roosterfish that fell to a sardine pattern and was later released. That’s the beach at Muertos Bay in the background. Another pretty fish held up by Larry Hildebrand from Chico CA who was on his first trip with us and picked up this and several other nice fish near Las Arenas. It’s her first! 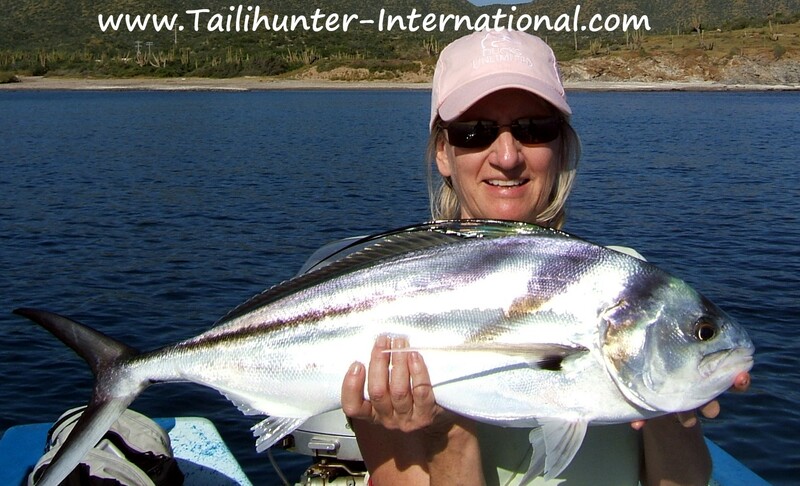 Claire Ames from Idaho got into the nice roosterfish bite with this school-sized fighter she released after catching it in Bahia de Los Muertos. 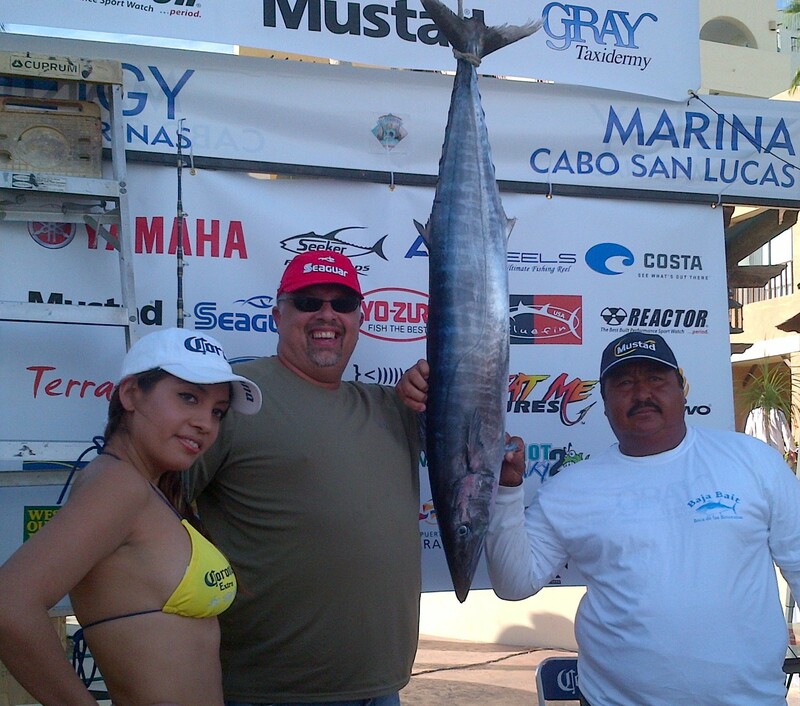 We spent the week in Cabo San Lucas working for the 14th Annual Western Outdoor News Tuna Jackpot Tournament. It was a huge success with over $564 thousand dollars in prize money and with 121 teams making it the largest tournament in Baja this year. This was the largest fish of the tournament a 372 pound giant! Last laugh! Don’t giggle at this tiny 30.4 pound wahoo. It is the most expensive wahoo you will ever see! It was worth almost $80 thousand dollars in prize money at the 14th Annual Western Outdoor News Tuna Jackpot Tournament when no other wahoo or dorado larger than this were brought to the scales! So…this guy was the winner…all the way to the bank! 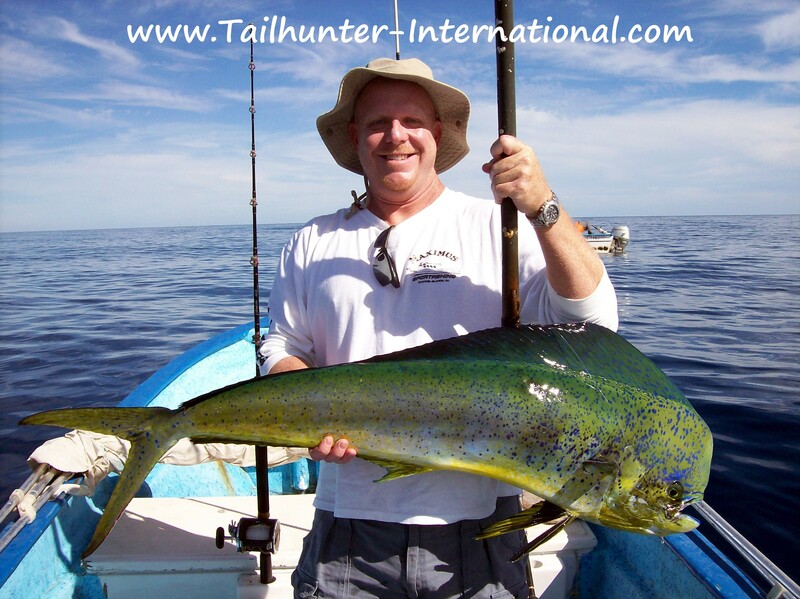 LATE SEASON DORADO AND ROOSTERFISH KEEP RODS BENT! Surprisingly, given the cooler temperatures and breezier conditions, we had a nice run of top water fish including dorado. Just when I thought the season had ended for dorado, our pangas got some nice numbers and good quality fish between 10 and 30 pounds each day. Most of our fishing, however, is now with our Las Arenas fleet shoving off from Bahia de Los Muertos because the north winds are making it a bit too rough to fish out’ve La Paz. 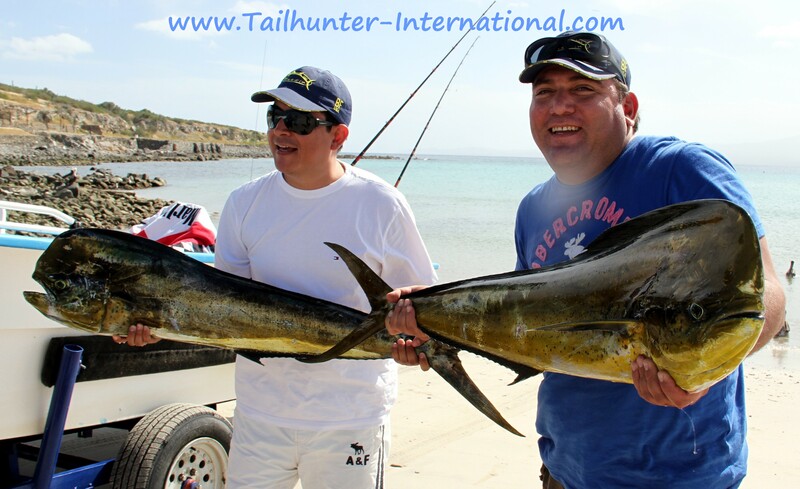 No sense in getting beat up when you get can the same fish in calmer waters fishing from the Las Arenas area. The dorado have been coming from a variety of areas. As close as Punta Perico just a few minutes from the beach and around the lighthouse where the deeper water starts have been good areas, but to the south near Boca de Alamo and south end of Cerralvo Island have also produced schooling mahi. In addition to the dorado, we’re getting inshore species like pargo, cabrilla and sierra and surprisingly the roosterfish are still hanging out as well near the lighthouse, in Bahia de Los Muertos and also near the island. Sierra have been increasing in numbers as the waters cool as well. We had a few knockdowns and hookups on sailfish this week also with all fish released. Dorado were a little harder to find this week, but there were some moments as conditions cool and the season changes. 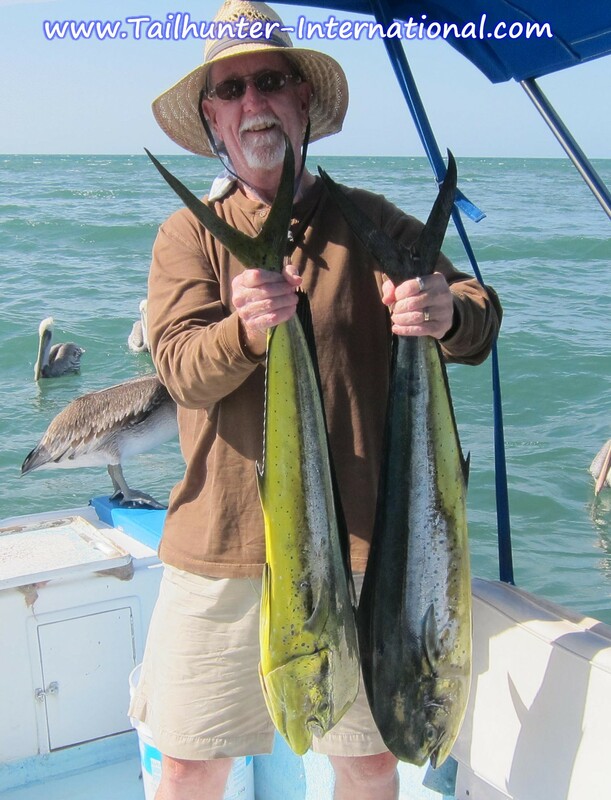 But, John Kennedy from northern California shows off a nice pair of mahi he caught north of La Paz. We have had so many great folks from Idaho this year. 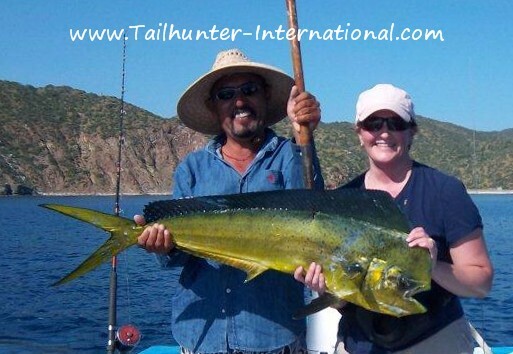 Many first timers like our new amiga, Barbara Choate who fished with our Captain Jorge and got his photo-perfect bull dorado just south of Bahia de Los Muertos. Now THIS is how to do it and have some fun! On light tackle and throwing a surface popper, Tim Hildebrand from Chico CA nailed this sweet bull dorado that fought him big time on the smaller rod! Two of our best amigos, Joe Barrera and Vic Patton, always come to see us at the end of the year. 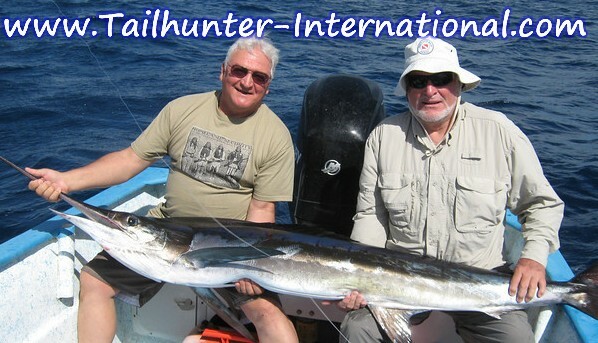 They pose with a striped marlin they pulled off the south end of Cerralvo Island. Given the cooler waters, it wasn’t a bad week for billfish with most getting released. They weren’t able to let this one go. First timer and using a flyrod, big grins for Randy Choate who got over a dozen roosterfish on the flyroad just inside Bahia de Los Muertos. All the fish were released. Randy is from Idaho. 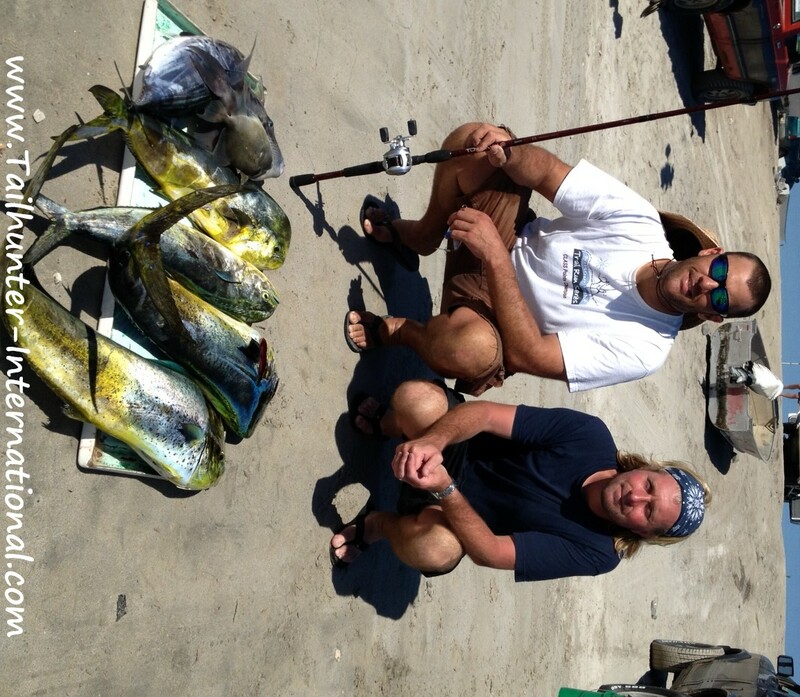 Tim Hildebrand from Chico CA and Ryan Chipley from Spokane WA tag-teamed for a good day of dorado fishing. 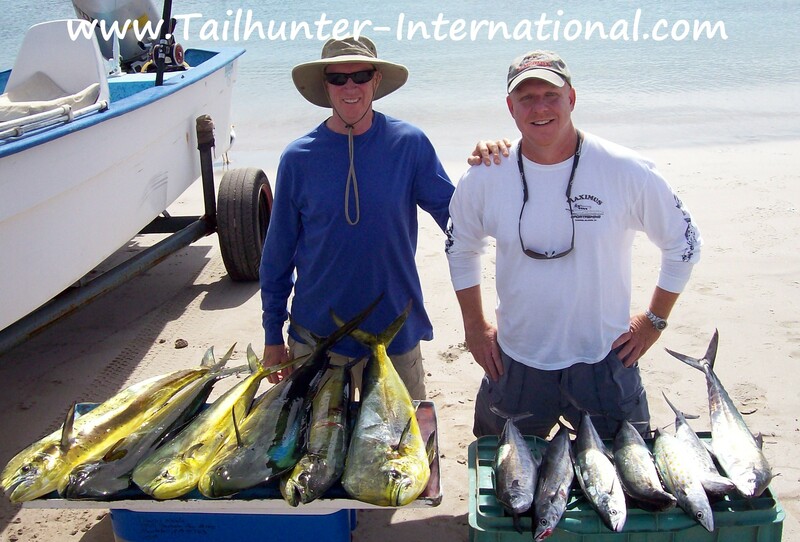 They also got the big triggerfish plus a bonito that they bled out and brought to our Tailhunter Restaurant for a big plate of sashime and Hawaiian poke.. The triggerfish ended up as fresh ceviche! Tom Ames with Captain Adolfo couldn’t stop smiling behind the great mustache. He got rooterfish, jack crevalle and several other species all on the flyrod fishing with us this past week on his first visit from Idaho. Seasons have definitely changed down here! Perhaps sooner than we had expected as air temperatures are dropping and water temperatures are also diminishing with more breezy and windy conditions. It’s a really nice time to be in La Paz! But, it has surely affected our fishing. Not a bad thing. It’s just different. It seems that in the span of 2 weeks we went from having 90 percent of our catch being dorado which are warm-water species to a nice mix of a number of species. We’re still getting dorado every day, but I counted as many as 10 different species taken as well on any given day. For example one day among a half-dozen of our pangas they reported: dorado, sailfish, marlin, pompano, jack crevalle, wahoo, roosterfish, bonito, pargo, cabrilla and rainbow runners! It made for some great fun fishing. Quite a smorgasbord of species and lots of action. One day, one panga got 4 wahoo. 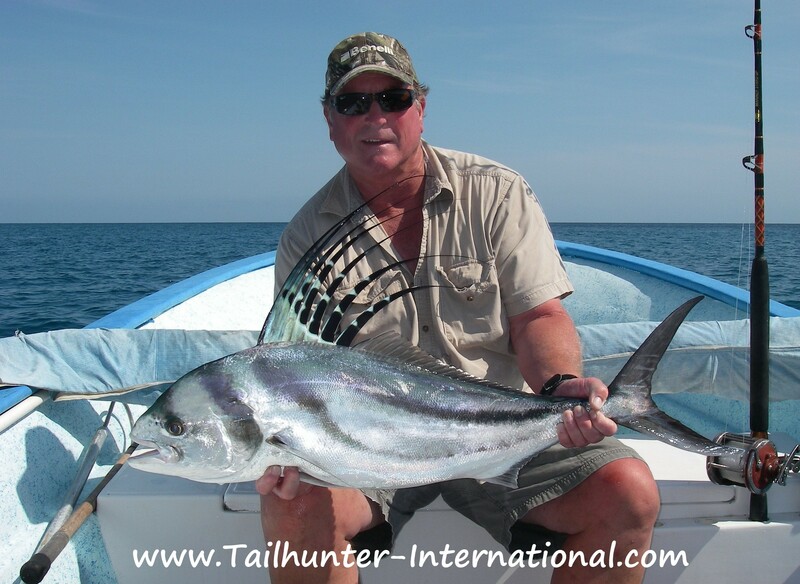 Another with 2 of our flyfishers got over 20 roosterfish caught and released! Another had fun throwing surface poppers on light tackle at dorado. Another with first timers were thrilled to catch and release their first sailfish! 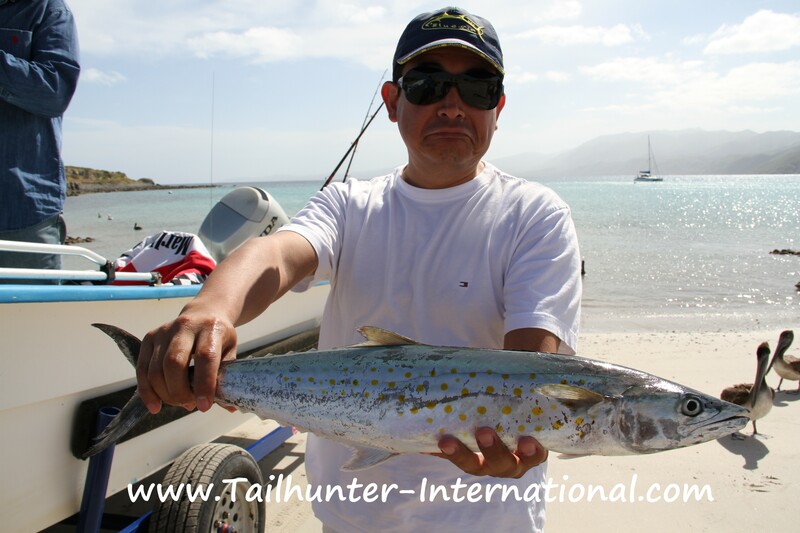 Most of our fishing now is with our Tailhunter Las Arenas fleet. The waters north of La Paz are getting pretty choppy and the fish are a bit of a run around the corner to Las Cruces area. If folks want to go, we warn them it could get bumpy. Also, as mentioned above, there’s just not that many dorado around which is the main catch of our La Paz fleet this past season. So, right now, unless someone says something, most of our fishing is with our Las Arenas fleet. Fishing is closer. There’s more species and it’s just a bit more protected from the winds that will surely get stronger as we head towards the end of the year. For now, fishing is pretty good.